Silicon Valley banking upstarts have technology for almost everything, but they’re still trying to catch up with thieves posing as their customers. New research shows that on an average day, about 4.5% of people who take an unsecured personal loan go back for seconds at other lenders later that day. The behavior, called “loan stacking,” more than doubled from 2013 to 2015, according to research from credit-reporting firm TransUnion. Here’s why the lenders care: Borrowers who take out a second loan within 15 days are four times as likely to be later identified as fraudsters, the credit firm found. 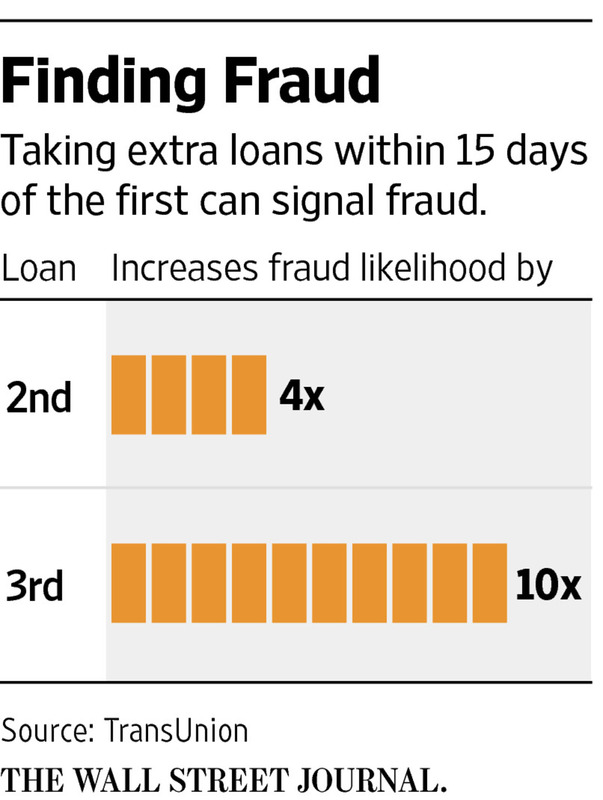 A third loan makes borrowers 10 times as likely to be frauds. “When money is moving out the door so quickly, people take everything in one shot and game the system,” said Pat Phelan, senior vice president at TransUnion. Online lenders sometimes have a tougher job than banks or credit unions to screen customers, especially since many tout the speed with which consumers can get loan approvals. It is also more common for online lenders to attract people they have never done business with before, since they don’t offer other financial products such as checking accounts or credit cards. The web-based companies typically make decisions to lend people up to tens of thousands of dollars in as little as a day or two on the basis of a borrower’s credit and income history. Now, some of the biggest online lenders, including LendingClub Corp. and Avant Inc., are taking more steps to combat the problem by sharing data about who is taking out their loans as well as using new technology to verify borrowers’ identity through mobile phones. TransUnion this month launched an exchange where lenders can share data in real time about who is seeking loans, for the purpose of detecting multiple applications. Using a neutral party such as TransUnion, lenders can see if people are taking out multiple loans without directly sharing customer information. LendingClub and Avant are among those that have signed up; TransUnion says eight of the 10 largest online lenders are participating. Separately, LendingClub, Prosper Marketplace Inc. and other firms this week said they joined a consortium created by ID Analytics LLC to similarly detect multiple loan applications. “Leveraging collective data…will further strengthen the experience for borrowers and lenders alike,” a LendingClub spokesman said. He said the lender “relies on a variety of internal and external tools” to analyze fraud risk. The online lenders are expanding their methods to catch up with big banks, which Mr. Phelan of TransUnion said use voluminous data histories and vast compliance departments to try to spot people with fraudulent identities. Some banks are also using biometric technology, such as fingerprints and selfies, to double-check the identity of their existing customers. 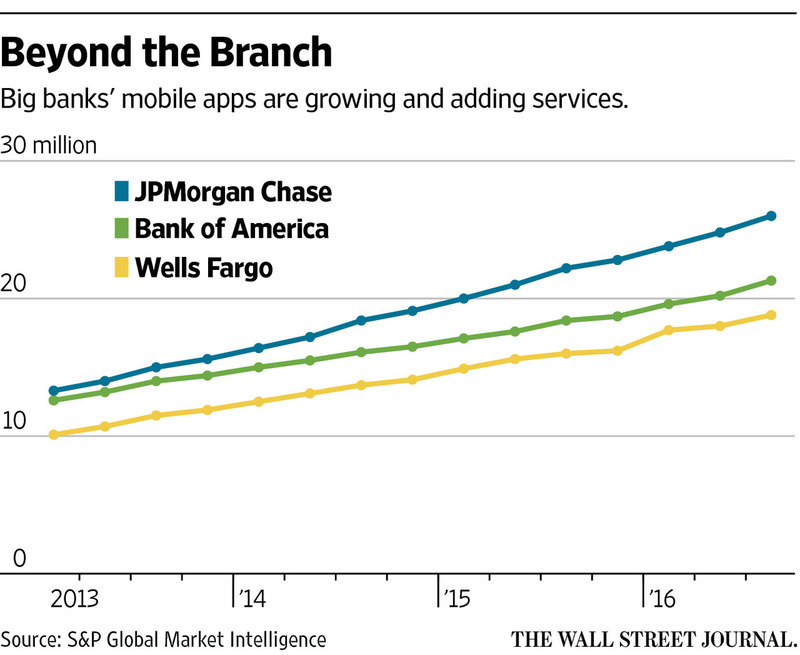 From J.P. Morgan Chase & Co. to Bank of America Corp., lending giants are increasingly competing with online upstarts. Both of those banks have more than 20 million users for their mobile applications, according to S&P Global Market Intelligence—a channel they can use to offer new services to existing retail customers. J.P. Morgan finance chief Marianne Lake said on the company’s earnings call this month that the bank was working to clear anti-money-laundering and know-your-customer hurdles so it could sign up more customers digitally rather than in branches. Online lenders are also ramping up security as they boost their loan growth and as they face scrutiny from investors, who in recent months have become more concerned about the quality of loans and their performance. Kabbage Inc., an online business lender that launched in 2011, this year began allowing borrowers to apply entirely through a mobile app. This asks applicants to use their phone to take a picture of a government ID, such as a driver’s license. That photo of an ID is verified by Mitek Systems Inc., which charges a transaction fee for the service, a follow-on to a popular feature offered by the company that analyzes pictures of checks taken by mobile phones. Before starting the new verification product, Kabbage had been rejecting as many as 3% of its daily online loan applications as potential cases of fraud, said the firm’s CEO, Rob Frohwein. The firm feared it might be turning away some legitimate borrowers, he added. Now, Kabbage anticipates getting that rate down to about 0.5%. “Additional technology doesn’t mean fraud attempts will go down, but we’ll be able to accept more applications” as the firm gets more adept at rooting out suspicious borrowers, Mr. Frohwein says. Avant, the Chicago-based online lender, also recently began using its mobile app for new borrower applications, which allows it to capture the photo of the borrowers’ ID as an element in its verification process, according to the company. 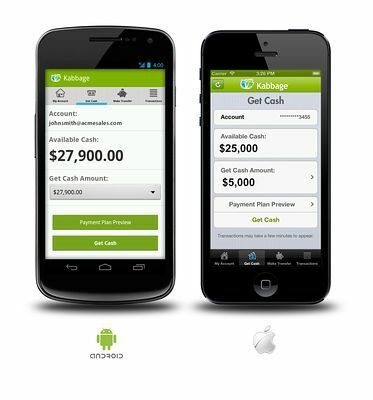 Not all online lenders use a mobile app for new borrowers. At LendingClub borrowers apply through a website, and are called on the phone to confirm information or request additional documents when the lender deems it necessary. Prosper works with software company The ID Co. to help confirm applicants’ identities with their bank accounts, as one tool to identify customers.